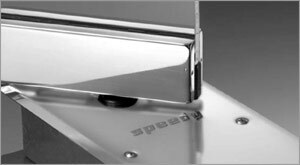 There are more than 4,000,000 Speedy door closers installed throughout the world. In 60 years of experience Casma has perfected the choice of materials and their use in improving the performance of their products under any conditions of use. All Casma door closers are built and assembled entirely in Italy and have a mono block cast iron structure. Casma door closer mechanisms are practically weatherproof, useful life is over a decade. Three years guarantee and in special instances extendible to 10 years.